Before you buy or sell, make compliance a part of your real estate strategy. Like any professional industry, real estate is regulated and has requirements for licensing. Staying compliant with these requirements is essential to legally practicing as a real estate agent. In fact, you cannot carry out real estate agent work without proper and up-to-date licensing. A proactive approach to license management can save your real estate brokerage significant time and hassle. Stay in good standing and avoid lapsed licenses with our full-service real estate compliance services. For a free evaluation, contact us to speak with an Account Manager. Below, we outline the important role that brokerage licensing plays in regards to real estate. In most cases, real estate brokers can work as agents, but agents cannot work as real estate brokers without a broker’s license. With few exceptions, any person or business entity that engages in brokerage must have a real estate license. Real estate brokerage firm licensing requirements vary state-by-state, so it’s important to stay up-to-date regarding your location’s specifications. The good news? An experienced, dedicated compliance partner can help you take a proactive approach to maintaining real estate licensure and certification. 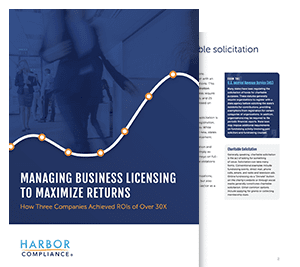 Contact Harbor Compliance today to help you simplify the professional licensing process. The following guide contains an overview of real estate practice licensing and specific board requirements in each state. The real estate industry is primarily regulated at the state-level. Each of the 50 states and the District of Columbia has a board or commission dedicated to administering regulation of the real estate profession. A business entity offering real estate brokerage services to the public typically must register with the real estate commission before conducting business activity. Firm registration is currently required in 41 states. Real estate firms should become properly licensed prior to practicing to ensure compliance and avoid state fines or penalties. Licensure for brokerage firms usually follows incorporation or foreign qualification of the business entity with the secretary of state. Some states do, however, require real estate brokerages to have their name approved by the real estate commission before filing with the secretary of state. After registration with the secretary of state, firms must apply for a real estate brokerage license through the real estate commission. Every state that issues firm licenses requires the appointment of an individually licensed real estate broker to oversee the firm’s activities. Depending on the state, the appointed broker is often called either a qualifying broker, designated broker, or principal broker. In addition to the firm license, companies with branch offices will often need to apply for separate branch office licenses. Branch offices generally appoint the same designated broker as the main office, but they must also appoint a broker or salesperson as the on-site manager of the new branch. Although brokerage firm licenses are similar across many states, there are some unique requirements to be aware of. For instance, Massachusetts based firms must send a letter of legal existence and a $52 fee to the real estate board in order to receive an initial license application. Brokerages in Hawaii are only required to license one branch office per island. Fees for initial licensure range from $10 to $705, with an average license fee of $185. Pennsylvania charges only $10, while Connecticut filing fees total to $705. Brokerage firm license renewal varies by state. Slightly over half of the states that require firm licensure call for licenses to be renewed every two years. Almost all other state licenses renew annually. Tennessee is one exception to this rule, as they do not require a renewal filing. Like initial application fees, renewal fees also vary by state. There is no fee in Arizona, while Connecticut charges $383 to renew a license. Firms can expect to pay closer to the national average of $150 when applying for a license, however, the most commonly applied fee is $170. Looking for real estate broker certification requirements in a particular jurisdiction? The following table summarizes firm licensing requirements across the United States. Click on any state for the licensing information specific to that state. Depends on when you register: $170 for registering in the first year of the biennium or $85 for registering in the second year. By September 30 of even-numbered years. Only required when company information changes. No fee for renewing a corporation, llc, or partnership. There is a $60 fee for each branch office renewal. There is no form, follow the instructions instead. Renewal is not required, but firms must update information whenever it changes. $705 or $825 for reciprocal firm registration. $375 for odd-numbered years and $383 for even-numbered years. Specified at the time of renewal. By April 30 of even-numbered years. Depends on when you register: $486 for registering in the first year of the biennium or $349 for registering in the second year. By November 30 of even-numbered years. By October 31 of even-numbered years. $50 for broker company or $25 for professional corporation. $50 for broker company or $20 for professional corporation. Look up your firm name to print renew applications. Biennially by the initial registration date. Maryland does not issue firm licenses in general, but brokers wanting to open a branch office will need to apply for a branch office license. Depends on when you register: $71 minimum and $143 maximum. Depends on when you register: $91 minimum and $163 maximum. $75 for one year renewal or $150 for two year renewal. Either annually or biennially depending on which option is chosen. $80 for Missouri domestic companies and $150 for foreign companies. Application for a Real Estate Corporation, Partnership, or LLC License or Professional Corporation Application. $50 for Missouri domestic companies and $150 for foreign companies. Montana does not issue firm specific licenses, instead, individual brokers are asked to supply firm information. Nevada does not issue separate firm licenses, but individual brokers must include business information as a part of their application. New Mexico does not issue separate firm licenses, but individual brokers must include business information as a part of their application. New York does not have a separate firm application, but the corporate information is required on the individual broker license. $100 for domestic firms and $225 for foreign. Oklahoma does not have a separate firm application, but the corporate information is required on the individual broker license. Oregon does not have a separate firm application, but the corporate information is required on the principal broker license. By May 31 of even-numbered years. South Carolina does not have a separate firm application, but the corporate information is required on the broker in charge license. Utah does not require renewal of the registration unless information changes. Biennially by the last day of the month of initial registration. West Virginia does not have a separate firm application, but the corporate information is required on the broker license. However, there is a license for branch offices. By December 14th of even-numbered years. Associate Broker - Associate brokers are qualified to work independently as a broker, but choose to work under the authority of a designated broker. On-Site Manager - A broker or salesperson who oversees the operations of a branch office under the authority of the designated broker. Qualifying Broker/Designated Broker - An experienced and licensed real estate broker responsible for management and operation of a real estate firm. Real Estate - Land, buildings, and their permanent improvements and fixtures. Also called "real property" in contrast to personal property. Real Estate Agent - This term refers generally to any licensed real estate professional. Reciprocity - Reciprocity makes it easier for out-of-state real estate firms to gain approval to operate in a foreign state by streamlining some licensing requirements. Offers a license verification database accross 43 jurisdictions. Aid education, research, and advocacy efforts in the real estate industry. Real estate trade organization that provides information and resources for development of the real estate industry. Research and education association concerned with responsible land use and creating sustainable communities.